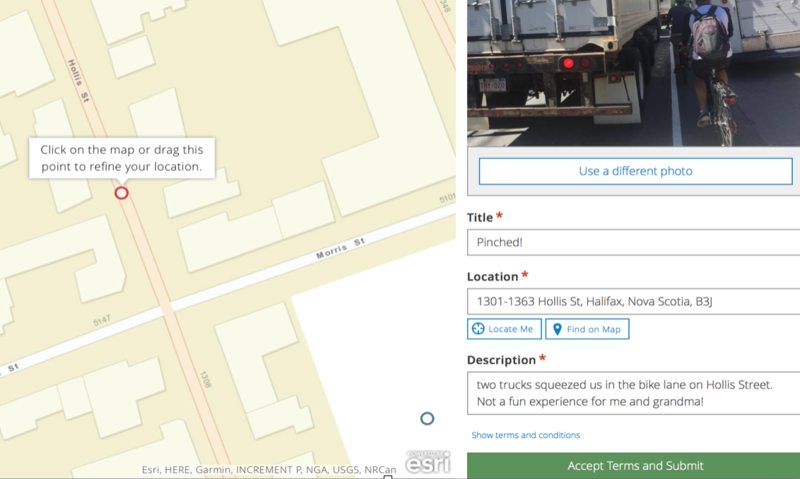 A snapshots and notes App for better cycling in HRM. Click to try the app! Have you ever encountered a car parked in a bike lane, a broken bike rack, or missing bollards on a bike lane? Daily commuters often notice a cycling issue before anyone else. The HCC and Dalhousie University have created a crowdsourcing cycling app to capture realtime data about cycling concerns in the Halifax Regional Municipality. Cycle snApp allows us to collect information that will highlight the areas that need attention. The app consolidates issues on a platform that is easy to use, public, and provides data to fix cycling problems faster. Community participation captures feedback into transferable data that can be used for making improvements to the cycling experience in HRM. CycleSnapp is a simple, but effective way to capture feedback about cycling problems. Every Cycle snApp helps makes cycling better in Halifax! The web based app doesn’t require a download or login and is completely anonymous. For more information, please send inquiries to contact@cyclehalifax.ca.